Disclaimer: These ties were provided by Oxford Rowe at no cost to me in exchange for an honest review. I stumbled upon Oxford Rowe thanks to the newest updates to the Instagram algorithm – you know, the part where your feed now shows you content from accounts you’re not following. Then, I started looking through their post history and images they were tagged in. What I found was a company with a carefully curated selection of menswear accessories. 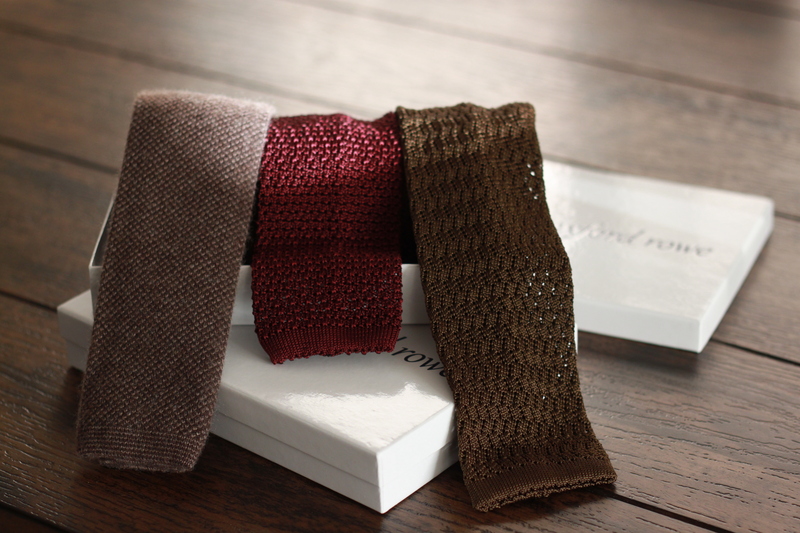 They offer a limited range of versatile neckwear pieces: a variety of knits, shantung, grenadine and printed silk ties. They also have a nice collection of pocket squares. I didn’t previously own any knit ties, but the Oxford Rowe knit tie collection appealed to me. On their website, Oxford Rowe mentions a few things that caught my eye. All the pieces are handmade in Italy. The knit ties are not super skinny. The colours are exclusive. As part of some background for this review, I asked for some clarifications on these points. So, yes – every piece is handmade in Italy, and for their knit ties the fabric is woven and the colour selected by Oxford Rowe each with the specific goal of having a place in a versatile and timeless wardrobe. 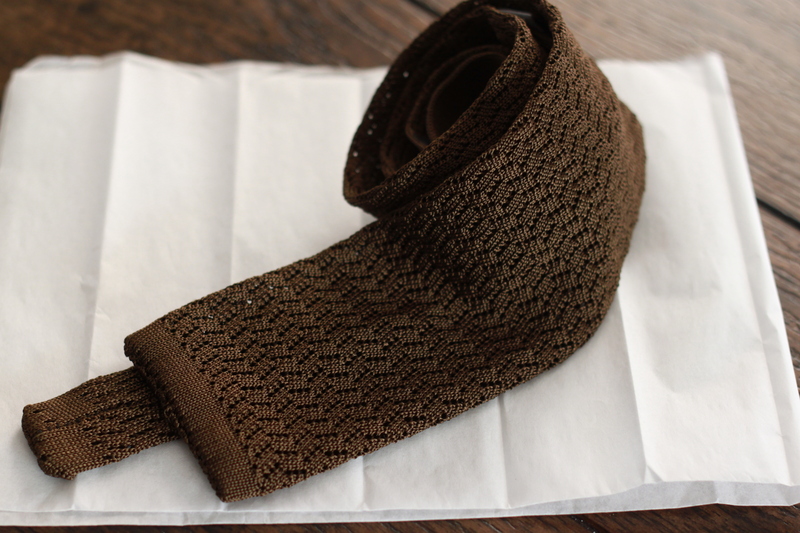 Their knit ties range from 2.5″ to 2.75″ in width, which is pretty classic for a knit. Oxford Rowe includes free shipping within the USA and Canada on orders over $50, which is awesome for my fellow Canadians! It’s rare that we are able to take advantage of offers like that. Free shipping is also available internationally for orders over $250. The standard free shipping option is through USPS, which is your best bet. These ties were shipped via UPS, and they charged me $70 to calculate that I owed $36 in taxes! How’s that for service! 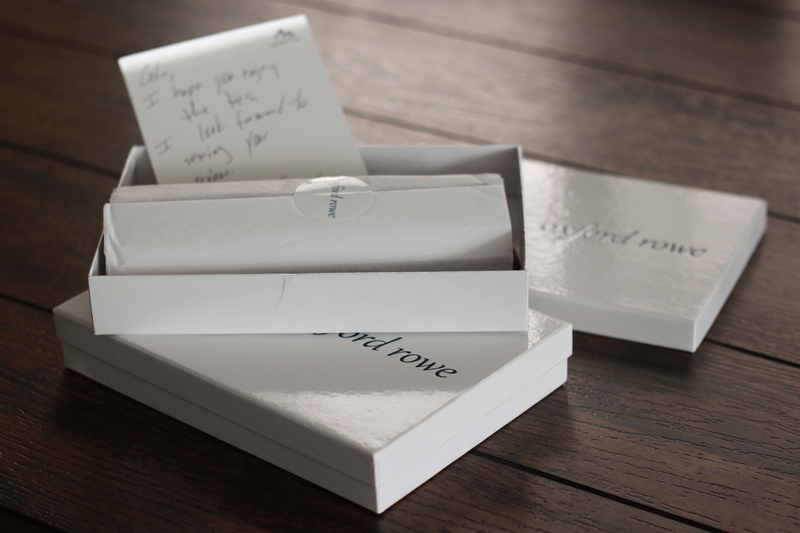 The ties were shipped in two nice boxes, and were wrapped in tissue paper. The boxes were sturdy, and made the journey to me without damage. 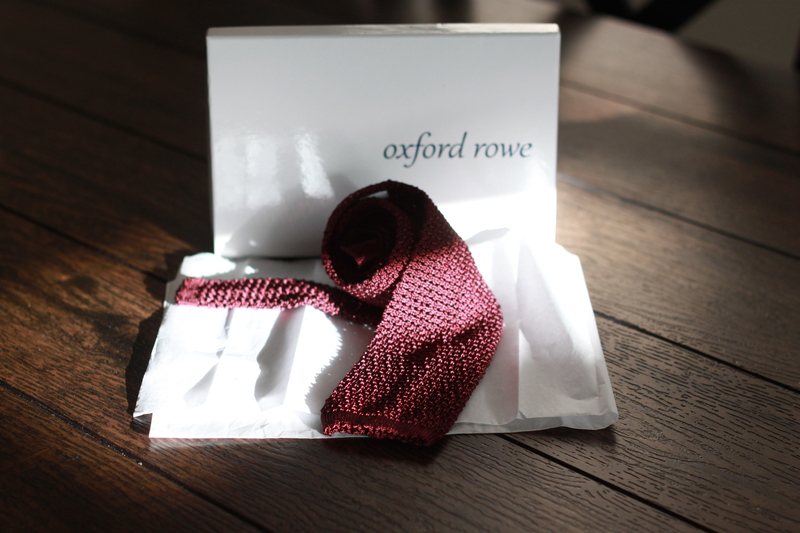 These Oxford Rowe knit ties are legit. 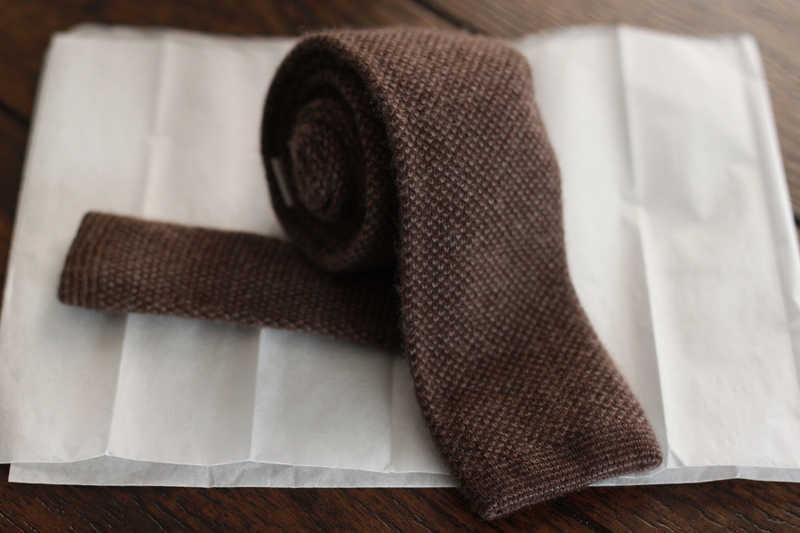 The ties came without and blemishes or pulls, and the finishing is clean overall. I like that there is a piece of material stitched to the underside to allow better adjustment of the part that will sit under your shirt collar. It also helps the tie keep shape when tying or adjusting the knot. The flat bottoms are even, and the back stitching is done well. There are a number of knit styles to choose from, and James at Oxford Rowe was kind enough to let me sample three of them. I wanted to get a good feel for the different selections available, and learn how different styles of knit ties might fit into my wardrobe. This one definitely caught my eye, and not just because it is the first tie listed in the knit tie section on Oxford Rowe’s website. The melange of browns, mixed with the knit weave and the softness of cashmere was just perfect. 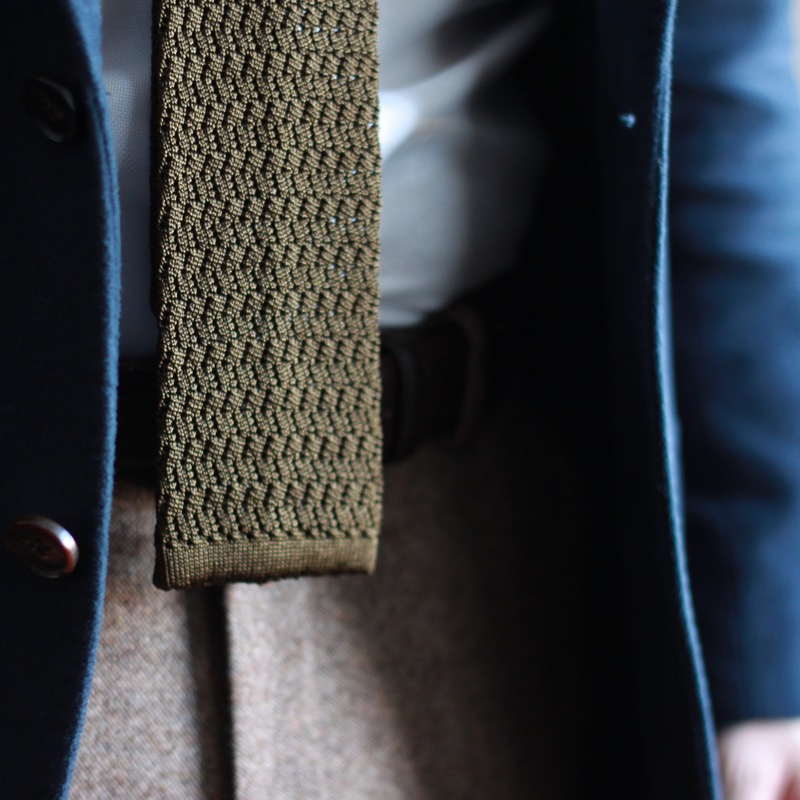 This tie exudes cozy winter vibes. Generally, I’ve been somewhere between agnostic and uninterested in flat bottom knit ties. I always thought it looked kind of weird. 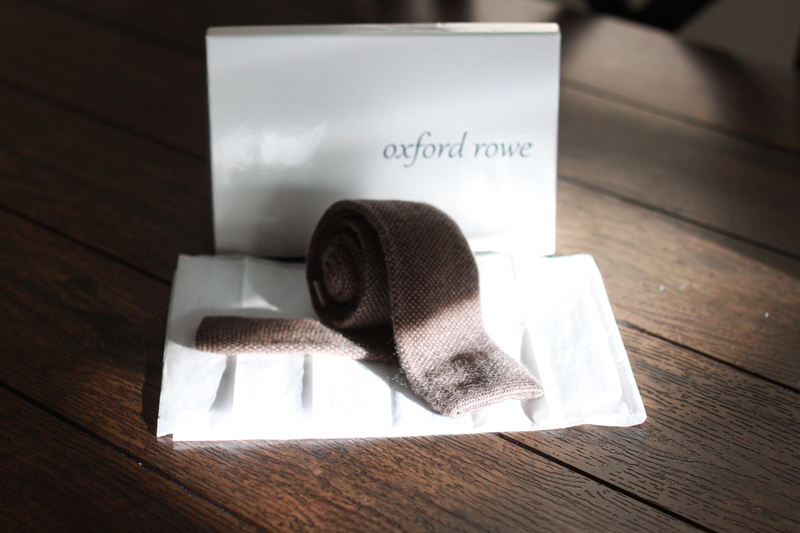 Something about this cashmere beauty changed my mind – could be that they aren’t super skinny – and opened me up to the rest of the Oxford Rowe knit ties. 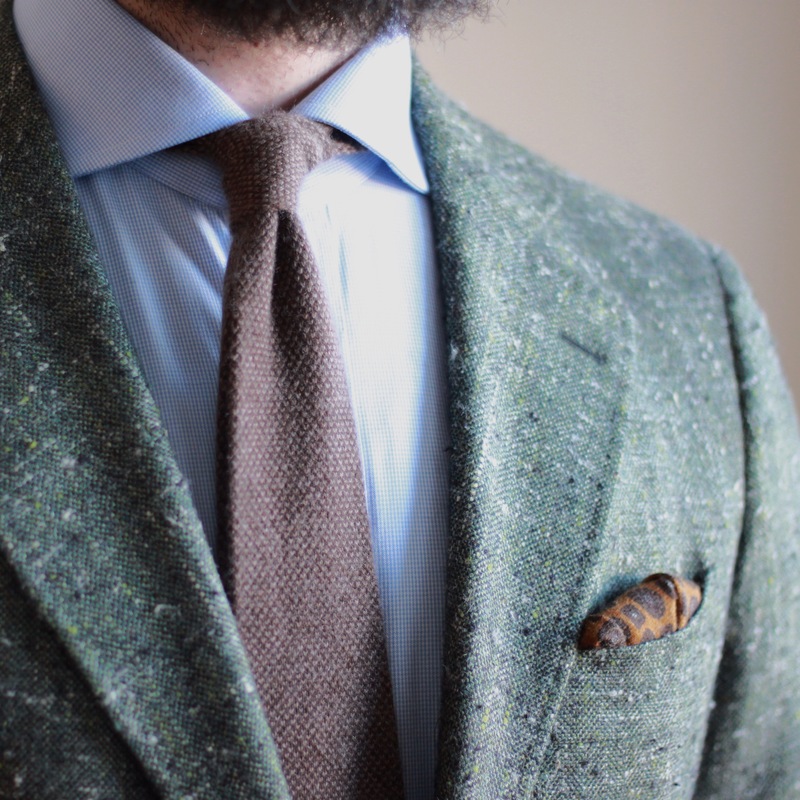 Anyhow, this tie is a great seasonal piece that can work well either side of center on the formality spectrum. This cashmere piece is quite a dense weave. It has loads of soft texture, but doesn’t have that gauzy, see through appearance the other knits have. This really lets the variegated brown yarns carry the visual weight. It ties a nice knot too. I was expecting to like this tie the most, but as beautiful as the fabric is, I can’t help but feel I’d prefer something like this in a more traditional style and construction. If I’m going to wear a “knit tie” I want the “knit tie” experience. A shade lighter than burgundy with an underlying vibrancy, this is a fantastic staple colour. The depth of colour and texture combine to form a visually interesting piece that won’t steal away all the attention. Something about knit ties that didn’t occur to me was how they would feel and perform when tying a knot. As you can see here, the knot is a little smaller than what a normal silk tie might make. It’s also pretty tricky to get a dimple with such a loose weave, but I did my best! 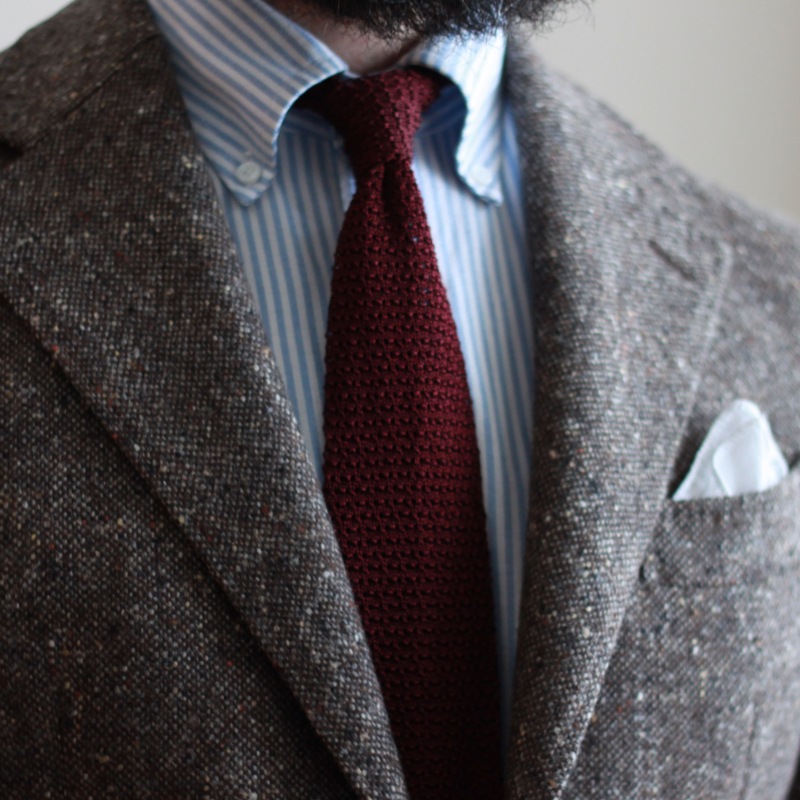 In the end, when wearing this knit with a button down collar shirt the knot is appropriately sized. I do enjoy the crunchiness of this tie, and the depth of texture is fantastic. 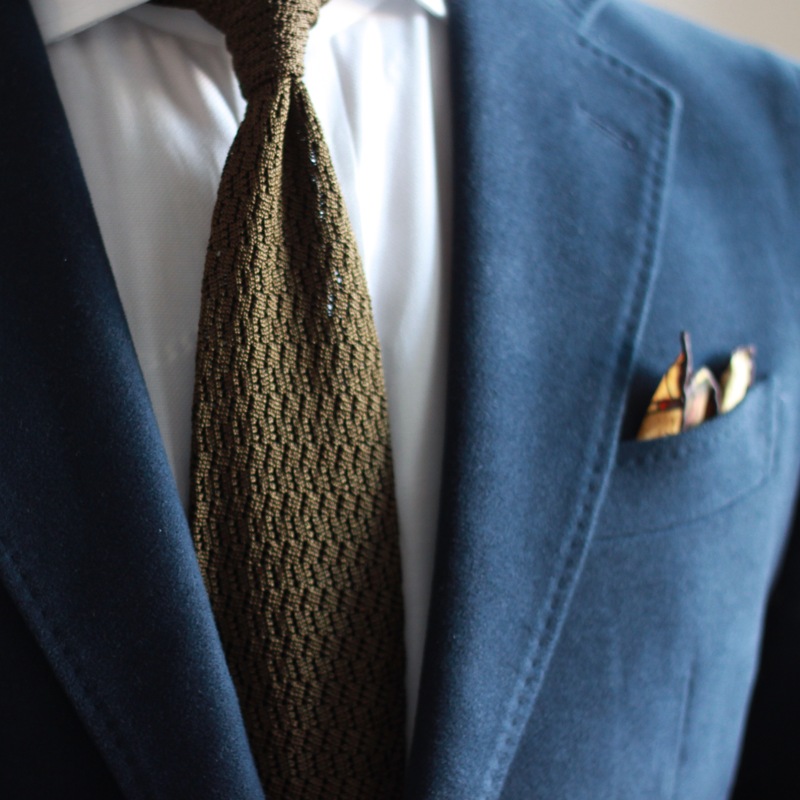 As far as knit ties go, it’s a great example. 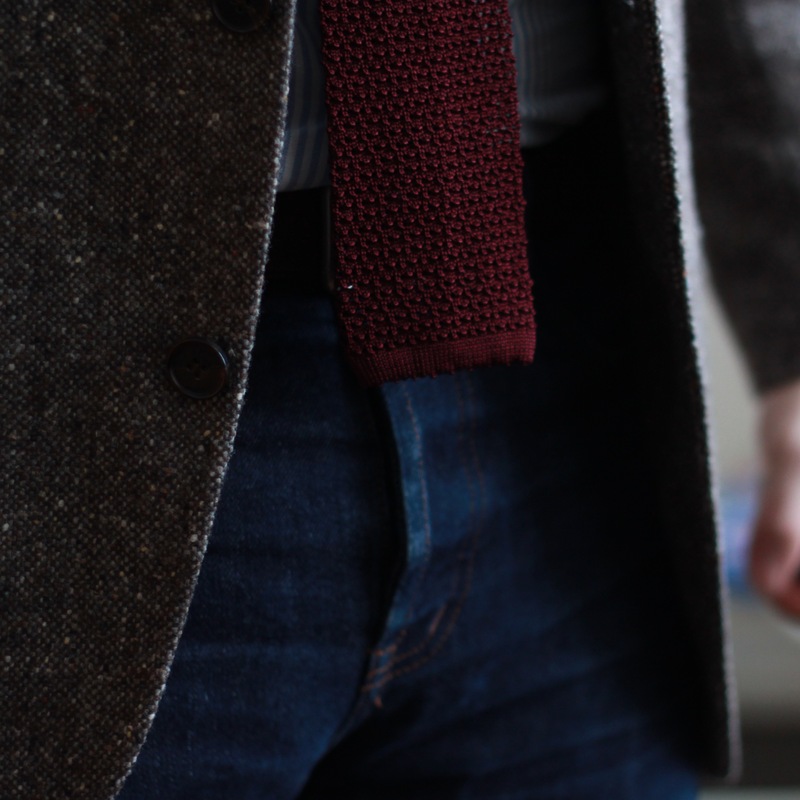 I’ll continue to wear this one for sure – It seems right at home with tweed and denim. On the website, this appears to be a fairly brown interpretation of olive. 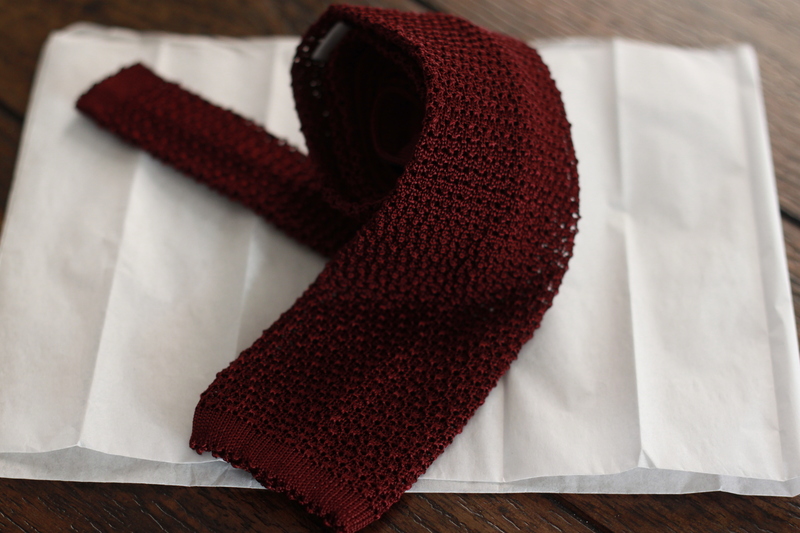 Similar to the merlot crunchy silk knit, the colour of this tie has a wonderful vibrance to it. In the light, the olive base has shades of brown, and highlights of a coppery tone. It’s quite nice. I found that this zig zag weave was a bit sturdier than the crunchy knit, and I was able to tie it a bit easier and produce a decent dimple. I can see myself ordering more of these ones. There’s a great brown, and I think the charcoal would be a nice addition. Of all the knit ties they offer, the zig zag knits are the best choice for me. I quite liked the slightly more refined knit texture and that they tie a really nice knot. These knit ties being just a hair wider than the others (1/4″) added just enough width. They have some of the crunchy silk texture, but to me aren’t as casual feeling. This makes it the most versatile of the offerings. I’ll continue to wear with textured tailoring, and I think the zig zag knit will work really well with denim as well. 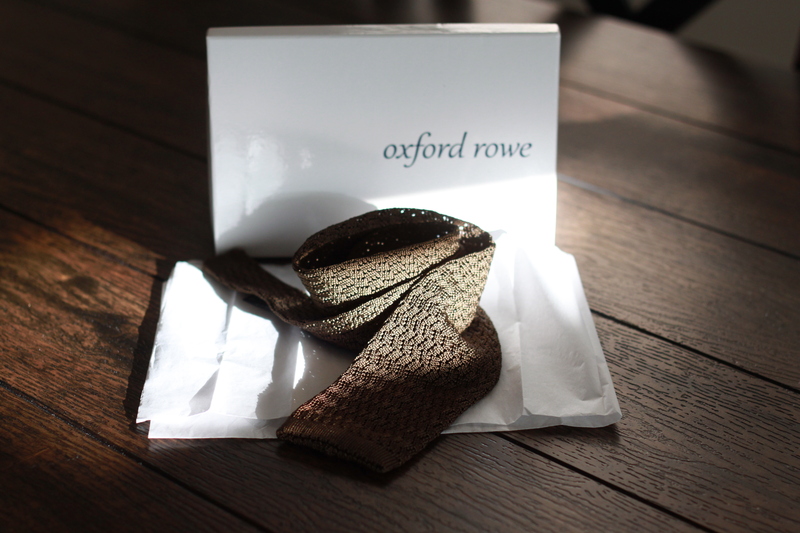 These Oxford Rowe knit ties are a great value for the money. Materials and construction are great, and the collection to choose from is full of ties that would find good use in any wardrobe. I’d like to thank James for the opportunity to check out his products. I’ll happily recommend Oxford Rowe to anyone that asks. Go check them out!